For voltages 6.0 to 75 volts DC Power consumption approx. 2.5 watts at input power up to 6.4 volts (60 to 70 Lux brightness is achieved this way); approx. 3 watts (90 Lux) at higher voltages. Suitable for 6-volts-supply with strongly limited current (p.ex. Bosch Classic) as well as drive systems that supply the headlight with battery voltage. 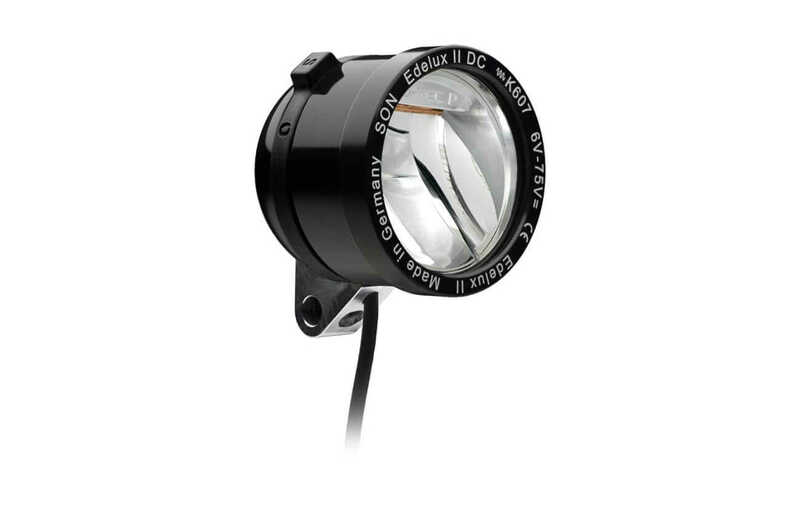 Edelux II DC 6 to 75 Volt is equipped with a 140 cm coaxial connecting cable, an On/Off switch, and a rear light output regulated to 6 volts DC. In case no switch is needed, the switching ring may be replaced by a covering ring.